Happy Monday Morning! Hope everyone had a great weekend and is ready to get the new week started! * To produce fresh, innovative, nutrient rich skin care products without the use of synthetic fragrances, harsh preservatives and ANY potentially harmful ingredient. * To educate our customers about ingredients used in the skin care industry so they can make healthy decisions. * To be on the forefront of research and efficacy of naturally sourced ingredients. * To be committed to green business practices. Tilvee also takes a great approach towards making sure their products meet healthy and safe standards, and also their business as a whole. They have a great Green Business Practices plan in place that covers every area of their business; paper, shipping, packaging, even their building materials. Additionally, I love their site design. It’s visually pleasing and easy to navigate. Unique dry masque formula rich Acai & Pomegranate that gently purifies & instantly softens. Our Acai Pomegranate Rejuvenating Masque is an innovative dry masque formula that purifies, instantly softens and boosts the skin’s radiance. Pomegranate and Acai deliver powerful antioxidants to fight free radical damage and aging. Rhassoul clay detoxifies, improves tone, texture and elasticity. Bamboo gently exfoliates to reveal smoother skin. I loved this masque! Be forwarned that it will make a bit of a purple red mess and temporarily turns your finger nails a little purple. I guess it’s really no different then if you were eating a Pomegranate. However, the result is insanly soft skin with a kind of tingling feeling. I just mixed it with a very small amount of water, but I will be trying their Cranberry & Honey recipe soon! I also got my husband to join in the mini-makeover and it really calmed red flakiness he suffers from. While we were at it I slapped some on my mother-in-law (no, not literally) the next morning and she was very happy with how clean and smooth her face felt. All of us were very happy with this Masque! Want to try some of this great product? Then get your entries in below! 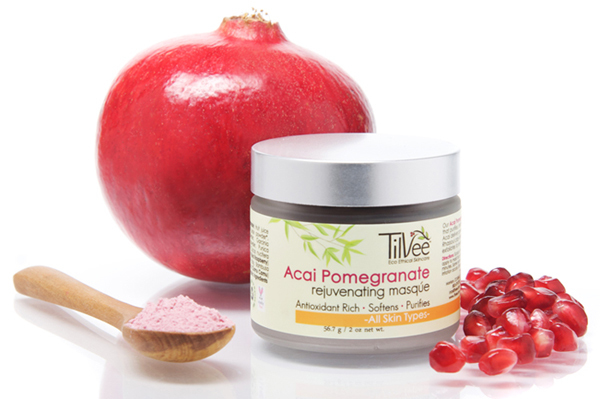 Tilvee will be giving one of my readers a full size Acai Pomegranate Rejuvenating Masque! Do as many of the below as you wish and leave a separate comment for each one. One winner will be chosen on Wednesday 2/25/09. Please don’t forget to leave a separate entry and any entries that show obvious laziness i.e. a simple “Thanks for the great giveaway” will not be published therefore not counted. It’s just not fair for the people that do know how to follow simple directions. US residents only. Thanks! Random.org picked commenter 168. Congrats! I would love to try the Tea Tree Facial Cleansing Bar. I would like to try the mint soap. I would like to try the Naked Soap. I’d love to try the Mandarin Mellow Soap for kids. Thanks! I would love to try the essential fatty acid soap. The combo of cedar and orange sounds like it would smell so good! The Mandarin Remedy balm sounds wonderfully versatile! The Naked Hydrating Lip Balm would be great to try! I would like to try the Tea Tree Facial Cleansing Bar! I’d like to try the Mint Soap. I would love to try the Mandarin Mellow Soap! Would love to try the Naked Soap! Would love to try the body butter! Thanks!!! debby´s last blog post..learning new things keep you young? The soaps look very nice. I’d like to try the Pomegranate Polishing Bar. I’d like to try the lip balms, especially the Pomegranate Conditioning Balm. I shared on Delicious…my user name is Nelsby. I shared on Digg…my user name is Nelsby. I shared on StumbleUpon…my user name is Nelsby. I Tweeted about this giveaway on Twitter…my user name is Nelsby. Tough choice…but I would love to try the Antioxidant Replenishing Cream. I’d love to try the Pomegranate Body Butter, thanks. Oh I would LOVE to try the Naked Soap!! Thanks for the Chance!! What a wonderful contest! Thanks for having it! Cleaning bar and body butter are on the top of my list to try! The Orange Mint Hydrating Lip Balm would be great for this dry winter weather. Love to try the Naked Soap. thanks! I’d like to try the Muscle and Joint Recovery Balm. I would love to try out the Calendula & Comfrey Remedy to use on my chapped skin. I’d love to try the naked soap. I would like to try the Pomegranate Body Butter. I would love to try the pomegranate body butter! Muscle & Joint Recovery Balm would be one of the many products I would love to try! would love to win something with pomegranted in it! Mandarin Mellow Soap looks great & yummy too…. I would like to try the Mandarin Mellow Soap. I’d like to try the Pomegranate Body Butter. I love all things pomegranate. Thanks for the giveaway! I would love to try the Mint Soap. Thank you for having this giveaay. Oh boy the pomegranate lip care sounds awesome. Would love to try that sometime. Thanks for the chance to enter. The Calendula & Comfrey Remedy Balm looks great! The Pomegranate Body Butter for me. Pomegranate Body Butter sounds great. I’d love to try the mint soap. Mmmm….mint! I love luxury soaps and mint is such an envigorating scent! I’d like to try the Pomegranate Body Butter. I’d like to try the shea butter cleansing bar since I have dry skin. The products look delicious! Stumbled! My stumble name is Lavendot. Antioxidant Facial Cleansing Bar is what I would like to try! Tweeted! My twitter is Lavendot. The Mandarin Mellow Soap looks lovely. The Mandarin Mellow soap sounds wonderful!! I would like to try to Pomegranate Body Butter- I have really dry skin and love thick body creams- and I bet it smells amazing! Pomegranite Body Butter sounds soothing. What an impressive diverse team of interesting and talented folks! I enjoyed my visit! I’m always looking for a good toner so I would try the raspberry hydrating toner . I’d like to try the Muscle and Joint Recovery Balm. Thanks for the chance to win! I would love to try the Pommegranate Masque as well as the Cranberry Balancing Lotion. For those that mentioned they have achy joints, have you tried chiropractic? It’s been so helpful for me. I would love to try Mandarin Body Creme for my lil girl. I think the Mint Soap sounds wonderful. Sounds so refreshing! I’d like to try Pomegranate Body Butter. I would love to see Botanical Rejuvenating Oil work on my face! I would use the Muscle & Joint Recovery Balm. I’d love to have a tin of the Calendula & Comfrey Remedy Balm. I would love to try their Lavender & Chamomile Soap. I just love fragrant cold pressed soaps. Thanks for a great giveaway! One product I’d like to try is the Muscle & Joint Recovery Balm. Thanks. Orange Mint Hydrating Lip Balm sounds awesome!! Thanks! The Raspberry hydrating toner sounds nice! I would love to try the Antioxidant Facial Cleansing Bar & the Muscle & Joint Recovery Balm as well. Mandarin Remedy Balm also sounds great! I would love to try the Calendula & Comfrey Remedy Balm! I’d love to try the muscle and joint recovery balm. Thanks for the giveaway! I would love to try the Lavender & Chamomile Soap! Susan C´s last blog post..I Never Grew Up is having a Birthday Bash! I’d like to try the Pomegranate Soap. i like the muscle and joint recovery balm.my back hurts all the time. I would love to try the Pomegranate Lip COnditioner for my dry, chapped lips! I could use some Muscle & Joint Recovery Balm. Really! Thank you! I would like to try the Raspberry Hydrating Toner. Pomegranate anything- how about the body butter. Tilvee has some fantastic products! I am so pleased to learn about them today! I would love to try the Antioxidant Replenishing Creme. The concentration of the antioxidant Rooibos sounds like a unique ingredient that will be effective in keeping the facial skin healthy and glowing! Thank you so much for the opportunity to enter. I’d like to try the Antioxidant Replenishing Cream. Thanks for the giveaway. I would like to try the Essential Fatty Acid Soap. Love to try the Pomegranet Body Butter!!! janna johnson´s last blog post..Market Research Opportunities – Feed That Piggy! I’d like to try the Shea Butter Facial Cleansing Bar. I like the Botanical Rejuvenating Oil! I would also love to try the botanical rejuvenating oil. It is so good for the skin. Lip Conditioner is right up my alley! Botanical Rejuvenating Oil I love nurturing my skin. i ususually use the tea tree oil soap to cleanse with, would love to try out the Antioxidant Facial Cleansing Bar to see which works better, ty so much! I want to try the Antioxidant Facial Cleansing Bar. The Raspberry Hydrating Toner sounds really nice and I’d love to try it. Thanks for the giveaway. I’d like to try their Pomegranate Polishing Bar – it really sounds different. I would love to try the orange mint hydrating lip balm. I’d love to try the mint soap. Thanks for the fun giveaway! I would choose the Antioxidant Replenishing Creme! Good luck to all! I would love to try the cranberry clarifting lotion. I’ve subscribed to your feed on Yahoo reader. I’d like to try the “Antioxidant Replenishing Creme”. Thanks! I would like to try the Pomegranate body butter. Thanks for hosting this great sweepstake and I hope that I win! The naked hyrdrating lip balm sounds good. My lips are always dry and I’m constantly using all kinds of balms to keep the moist. I really like the Raspberry Hydrating Toner. valerie m´s last blog post..FYI Blogger Follower Glitch! Botanical Rejuvenating Oil is just what my skin needs….and I would love to try it! 🙂 Thank you. I’m interested in the Antioxidant Replenishing Cream. Pomegranate Body Butter. Love body butters, thanks. The remedy balm sounds amazing! Shea butter facial cleansing cream. I’d like to try the Pomegranate Lip Conditioner! Botanical Rejuvenating Oil sounds nice. I would like to try their bar soap–especial the Mint Soap. Subscribed by email too. Hopefully I did this all right. Thanks for the chance to win! I’m a subscriber via Google Reader! And I would love to try the ‘Antioxidant Facial Cleansing Bar’! Please, include me in your giveaway drawing! Thanks and good luck to all! I WOULD LIKE TO TRY THE Pomegranate Body Butter! I like the Naked Hydrating Lip Balm. I like anything for my poor lips! I’d love to try their Peppermint & Teatree Foot Rescue Creme, and get the tootsies ready for summer. Thank you! the Botanical Rejuvenating Oil sounds nice….. I think the Pomegranate Polishing Bar looks good. Pomegrante Body Butter looks really good for the skin. Anti-oxidant replenshing creme sounds like it would surely help me out. Pomegranate Body Butter is a best seller, so that’s the one I’d like to try! I’d like to try the Acai Rejuvenating Mask. I’d love to try the Shea Butter Facial Cleansing Bar, sounds very moisturizing! I’d like to try the Naked Soap. I’d love the Peppermint & Teatree Foot Rescue Creme. Sounds like the perfect thing for achy feet (which I get!). I’d love to try the Pomegranate Body Butter. I love body butters! I would love to try the Mandarin Mellow soap. I can just imagine the heavenly citrus fragrance. I would love to try the Naked Soap. My skin is very sensitive to soaps and this sounds like a perfect solution! I’d like to try the Pomegranate Body Butter, Pomegranate Lip Conditioner, and the Raspberry Hydrating Toner.